I’d like to point a finger at the font downloads. Loads of applications on windows (an therefore wine) depend on the corefonts. These fonts are not part of wine and can’t be packed together with wine because of different licenses. So if You had apps, showing only symbols and garbage, this is for You 🙂 . 0.9.1 Built wget with –disable-nls (native language support) to get rid of the libintl dependency. 0.9.2 Built with sha1sum, as winetrix mac workaround is still not working and sha1sum is used now. This entry was posted on Monday, April 14th, 2008 at 14:03	and is filed under cross-platform, wine. You can follow any responses to this entry through the RSS 2.0 feed. Both comments and pings are currently closed. At the moment Trix.app doe not run here because I have no php installation. txs for pointing out… don’t know why wget is linking agaginst php. I’ll up a version without this dependency asap. Heya, looks like a great tool. I did notice that unless you have an active terminal window open it will crash out with an error. Other than that, fantastic tool. One request, I’m in Korea so if you could figure out CJK support it would rock. I belive winelocale does this under ubuntu, but for darwin, who knows. Hi Try 0.9.2… as winetrix now require sha1sum. I set chmod 777 for system32 and temp, what didn’t help. Tried the new trix.app included in your darwine 0.9.60 build, remains the same. BTW, Dan could include MSCOMCTL.OSX as well. Wanted to tell him this, but didn’t find a web form on his HP. First off let me thank you very much for your work to get wine “useable” on mac. The installation Process throws some unhandled_exception errors and from what I can tell these a wine errors. But I just wanted to ask, if someone had success. 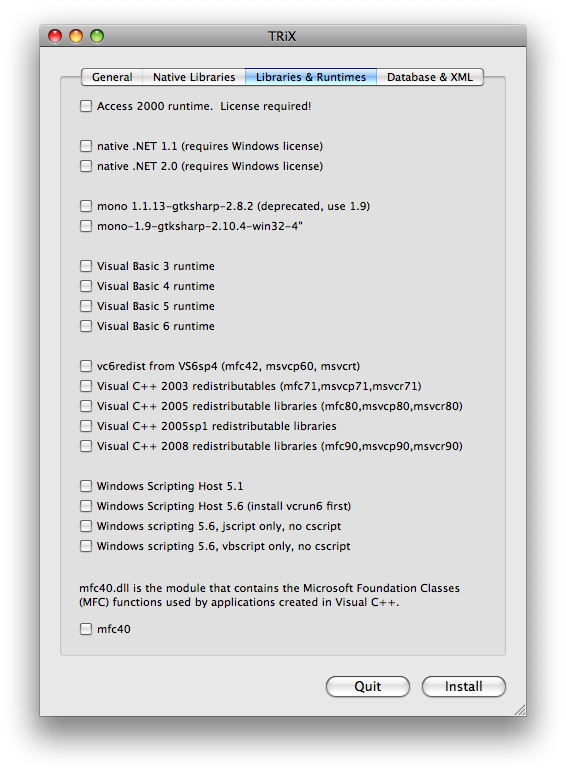 according to the wine devel list .net 2.0 only works for *some* command line tools, yet. But it’s got a very high priority. .net 1.0 is a lot more stable. 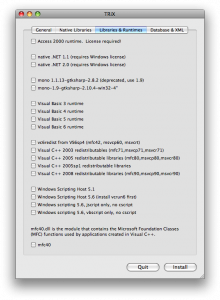 If your .net apps do not need native libaries, I’d try mono. Ok, so I have to wait a while… until then I stick to parallels and flashdevelop. It seems like fd doesn’t work with mono right now. Note: command ‘wget -nd -c –read-timeout=300 –retry-connrefused http://internap.dl.sourceforge.net/sourceforge/corefonts/andale32.exe‘ returned status 133. Aborting. I am trying to get ffdshow in combination with media player classic to run under crossover. I tried this for some time now. Now I am totally frustrated that it doesn’t seem to be possible. My opinion is that the picture quality is much better with ffdshow than VLC or anything els. So than I stumbled on to this site. I see that you have managed to get some form of ffdshow working with Wine? How do I get started to get the ffdshow MKV codecs to work under os-x? I like to integrate it with media player classic. Is this impossible? Hope someone reads this. I tried to install some stuff with TRiX on Leopard, but instead of opening a new terminal window it sent the commands via the terminal I had open into a IRC channel. Sure it’s quick and dirty, but too dirty this time. Sorry for being this negative. wine: configuration in ‘/Users/steve/.wine’ has been updated. Note: command ‘wget -nd -c –read-timeout=300 –retry-connrefused –header Accept-Encoding: gzip,deflate http://downloads.sourceforge.net/corefonts/arial32.exe‘ returned status 133. Aborting. 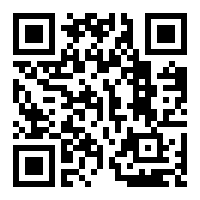 OK, I’ve added COMCTL32.OCX/MSCOMCTL.OCX, check it out. Tried TRiX (in v1.1.1 of Darwine). While I’m no Unix guru, I can see what it’s doing in the Terminal. It gets the downloads via cUrl just fine (doesn’t use wget), fut fails finding cabextract. It appears that it doesn’t set the PATH to find them. cUrl is already on my Mac, so it works, but in the end the script fails because of the lack of cabextract. At least I know how to fix it. By copying the contents of TRiX.app/Contents/Resources/bin to /usr/local/bin (where Darwine copied Fontforge/Freetype files), all went well, and the script used wget this time. Only thing was that http://www.redhat.com/f/fonts/liberation-fonts.tar.gz returns 404 not found. No big deal. Everything works fine up till the installation of runtimes. I originally checked the VB runtimes. However after a first error, I unchecked the VB runtimes and deleted the file in winetrickscache. However, on running the TRiX again, it goes ahead and still downloads the VB6 file. Note: command ‘cabextract -q –directory=/Users/Anime/.wine/drive_c/winetrickstmp /Users/Anime/.winetrickscache/VisualBasic6-KB896559-v1-ENU.exe’ returned status 1. Aborting. It’s pretty trivial from a user-standpoint to make curl use a proxy, but I can’t seem to find a way to get trix to do so. The .scpt file appears to be read-only, so I can’t update it to use the info for the proxy I’m stuck behind. I replaced /usr/bin/curl with a wrapper script that calls the real curl with my proxy info. wine client error:3e: version mismatch 386/339. What do I need to do to fix? sha1sum mismatch! Rename /Users/apple/.winetrickscache/./mplayerc_20080414.zip and try again. And, how do I uninstall? does Trix handle any of that? BTW, I cannot read the labels to the right of the fields in the comment pane. Have to hilite to tell what they say.